What Does Joe Veillette Build? 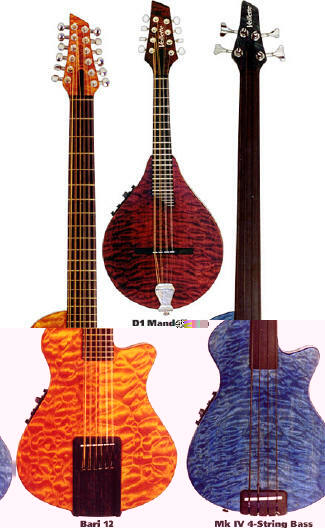 Veillette Mk-IV guitars, basses and mandolins are robust, stable, great sounding tools for musicians. They all boast sparkling, deep tone and amazing sustain in a compact, lightweight and well-balanced electric/acoustic, semi-solidbody design. All feature a concealed, acoustic-style piezoelectric bridge transducer system. Controls with active EQ are mounted on the top side of the body. Additional magnetic pickups are optional. A one-piece hard rock maple neck is attached to the body with a unique neck joint arrangement, which provides remarkable stability using a single large machine bolt. A zero-fret allows for perfect intonation and easy changing of string gauges. Rugged construction of quality materials, structural integrity and functional simplicity of design combine to create an innovative instrument with remarkable resonance and sustain. Rich acoustic tone and extraordinary playability combine to make Veillette instruments inspirational tools for making music. Joe has built guitars and basses for a lot of great players. If the first gun you ever fired was a 12-gauge shotgun, it probably just about knocked you down. It's the same shock with a Veillette Baritone 12-string: the first blast of sound is enough to rock your socks off. Kind of like the perfect hammer, the look is clean and holds fast to the form-follows-function adage. No frills whatsoever adorn these single-cutaway, mostly solid body guitars; no ivory purfling, no delicate pearl inlays, no fancy rosette or pick-guard. You can't even see the pickups on these acoustic/electric baritone guitars that Joe Veillette builds at his Woodstock workshop. What you do see is a chocolate gun-metal charcoal body, neck, and peghead equipped with strings, frets, tuning machines and a bridge. Routed into the side is an Alvarez pre-amp with a three-band equalizer; active parametric on the high and low, and a passive fader of the mid-range band. It has knobs for volume and contour and a standard 1/4" jack for the cord. That's it. Built like a truck, you can drop it, slide it across the floor, carry it out in the sun or cold, throw it in the trunk; you can't hurt it and it sounds like the voice of God. These are very serious instruments. "These are tools; it's about music," Veillette says. Joe struck out in business on his own a few years back. Previously, he had done extensive design and construction of custom guitars and basses with a number of Ulster County luthiers including Mike Tobias, Harvey Citron, and Stuart Spector. With a practical background in engineering and architecture, Joe recognized his forte at fashioning forms in wood. He adamantly refuses to get involved in constructing exotic electronic configurations, and fortunately, he doesn't have to, due to a design success he and Tobias did for Alvarez guitars. The long-range impact of that venture was an exclusive grant from Alvarez to use their proprietary design pre-amp/Piezo crystal pickup system in his own guitars. Also a working musician, Veillette is known locally as one of the popular Phantoms, or from his work with any one of a number of other area combos. He's also got a new trio called Blind Mice, and he's currently teaching doo-wop singing at Dutchess Community College. Playing guitar as well as singing with these groups has provided Joe the opportunity to experience the needs of the professional player hands-on. Veillette also builds standard guitars and has a new bass design similar to the baritone which is brand new to market. So far there are two finished: one was on hand and the other was out on demo at a mega-rockstar's current American tour engagement, but our focus was the Mark III 12-String Baritone guitar. Playing one of these beasts is a real awakening; they're a handful and a half. To begin with, they're tuned down to B as the root low note, five frets down from the normal E. They run with regular acoustic bronze strings despite the fact that the instrument is electrified. The deal with the Piezo transducer pickup set underneath the bridge saddle is that it does not require the usual electromagnetic interplay of something like a single-coil or double-coil humbucker style pickup, where the magnetic field generated by the ferrous material of strings interacts with a magnet to create the audio signal. As such, there is no need to use the less brilliant steel-wound strings that electric guitars normally require, nor is there the inevitable dampening of the string vibration caused by the magnetic interaction of steel and magnet. In the case of these guitars, the pluck of the string remains pure to generate an actual acoustic tone, with no feedback. A structural variation Veillette has pioneered seems almost illogical at first, but proves to be insightful to the nature of resonance in a non-hollow body. Normally, a solid body guitar such as a Gibson Les Paul or even a lighter weight Fender Telecaster or Stratocaster is cut from a solid or laminated slab of hardwood such as maple, ash, birch, or mahogany. Veillette guitar bodies are built with alder or poplar, a soft wood frequently used for rough block bracing in furniture. These are then topped with a thick veneer of figured maple, like the iridescent tiger maple Joe used on the instruments we saw. He then bolts on a one-piece rock maple neck, again often figured, and pieces the cant on the peg head. A single T-bolt holds the neck fast to the body and the bottom end of the string lock down to a Rosewood bridge. The resulting effect of the bronze strings vibrating into the soft-wood body lends a warmth to the sound. Instead of the cutting metallic sense that tends to come from an ash Tele, you get a sweet acoustic resonance. Remarkably, however, there is absolutely no loss in clarity, and there is more than enough sustain. Every bell and chime from the octave or matched pairs of strings rings crystal clear, and the woof of the tuned-down low end is dangerously stunning. The instrument must be approached with caution, and this is not an overstatement. "There's a lot to control sonically; it can get away from you," Veillette says. The sound is so big, the player must exercise extreme care to articulate the notes intended or else be overwhelmed with an orchestra of rippling crescendo. Getting a handle on it is kind of like driving a Cobra; one slip off the clutch and you're tearing up tires at 60 mph before you're out of first gear. But once you get the sense of how to tame the shrew, she sings like an angelic choir. An aid to grappling this tiger is the neck--it's a 26 1/8" short scale length with 24 frets and the action is low and fast. Though holding 12 strings cleanly in a chord is a handful, it is remarkably effortless on the Veillette neck. The neck is also wide enough to fit the average fingers without being a reach to hold on to. An incident from the "coincidence file" was what confirmed to Joe that he was on the right track with his design for the baritone MK III. The night before he set up the first prototype design, he was looking through George Gruhn's guitar book and came across a delineation of the guitar of the father of big body 12-string sound. Leadbelly pioneered a major chapter of the deep-ringing folk blues on a 1929 short scale Stella that was tuned a half-step away and measured within a quarter of an inch of Joe's design. No wonder then that current-day guitar masters like Jorma Kaukonen, Eddie Van Halen, John Sebastian, Billy Gibbons, Skunk Baxter and more have all purchased a black satin Veillette. And does this wolf want one? You bet. If you've ever played a Les Paul through a full Marshall stack, you know that special feeling when a power A chord smacks you in the chest. Alas, acoustic players have never been able to duplicate that sublime sensation…until now. Meet the Veillette Mark III ($1,650), an instrument that puts together the guitar puzzle like no axe in recent memory. First of all, it's a 12-string, imbued with a glistening, harpsichord-like tone. Second, it's an acoustic/electric, so you can put it through an amp, mixer or, PA and crank the hell out of it. Third, and most important, it's a baritone, meaning that you play it the same way you play a regular guitar, but it's just lower in pitch, closer to a bass' range. Okay, enough poetry, Shakespeare: What does the Veillette Mark III 12-String Baritone sound like? In the humble words of creator Joe Veillette, "It sounds…and feels…like a different kind of animal." On the tech side, the Mark III has a solid poplar or alder body with a maple top, a lovely stained-maple fingerboard 26 1/16" scale (Joe believes that the 12-string scale should be slightly shorter than the 6-string for proper tension and tone), and an Alvarez active piezo-pickup system. According to Veillette, the guitar is very function-oriented: "There aren't a lot of inlays or fancy bindings - this is a simple, elegant guitar. It's really a tool for making music…and I think it's the best thing I've ever done." As if to sanctify the birth of this 12-string beauty, Joe was thumbing through a book the day before he finished the Mark III. On the last page was a picture of Leadbelly's main axe, a 26 3/8" scale 1929 Stella 12-string that the folk-blues legend tuned down to the C, in other words, a vintage 12-string baritone. Consider it a heavenly email from the man who put the 12-string on the map to a modern luthier who was attempting to reinvent the instrument. The next day, Joe finished the Mark III and knew he had built a different kind of guitar. Better still, the guitar has been getting instant thumbs-up from every top player who's tried one, and each one Joe's made has sold instantly. And for the record, when you play a deep E minor chord on this axe, you are getting the big smack in the chest only previously experienced by electric players. With the Mark III, acoustic players can now feel the earth move.